“As always, the more stuffings the merrier” is the typical sign-off on one of my favorite events of the year, our annual Friendsgiving dinner. Born in our friend’s dorm room in college years ago (even before Friendsgivings became a so-called “millennial trend”), our potluck Thanksgiving dinner, held on one random weekend in between Halloween and actual Thanksgiving, has become a community staple for the 20-or-so of us who enter the event into our calendars with anticipatory vigor. Potential dates our discussed months in advance, as travel plans to come to town are arranged, and buzz about anticipated side dishes begins to take over the email thread. There’s something incredibly special about celebrating a holiday meal with your family-by-choice, and I’ve come to look forward to this friend-focused feast every year. 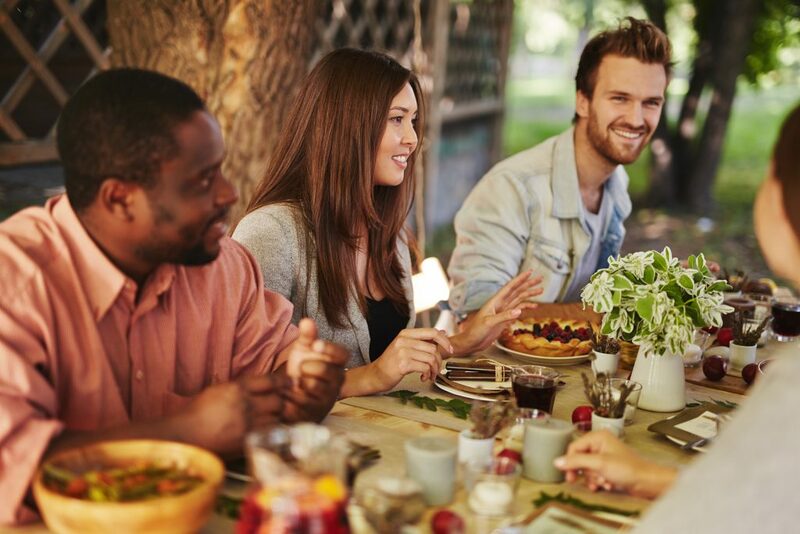 Not only is it delicious (most friends bring their favorite family recipes, creating a buffet of dishes perfected and loved over many generations), but it’s also a time to come together and catch up, watch football, play games, and work through the post-turkey tryptophan haze as a community. Interested in having a friendsgiving of your own? Here are some never-fail tips. Traditionally, the host makes the turkey and gravy, and guests provide everything else. Ditch the never-ending email thread and make sure dishes aren’t repeated by organizing what others are bringing with a meal coordinator like Perfect Potluck. The meal-planning tool is a great way to see what others plan to make and ensure that there’s no overlap (except stuffing, always include all the stuffings). Not the best cook? Drinks count as much as that candied yam side dish. Be sure not to forget items like cutlery, serving spoons, and napkins. You don’t have to go overboard with the autumnal decorations (although I am a big supporter of the paper bag cornucopia), but a little effort in the decor department is always appreciated. Consider picking up Thanksgiving-themed paper plates and napkins for a decorative touch — and to help minimize the cleanup afterwards. Put together an upbeat playlist for some background music, and light a few spiced candles to add some warmth to the already-scrumptious smell of the meal. Before we’re about to eat, we take a few moments to go around the room and express what we’ve been the most thankful for that year. This tradition provides a centering, spiritual moment for all of us as we remember the many gifts we’ve been given, especially that of our friendship over the years. Similarly, we pass around a notebook each year for everyone to write down a short message. It’s always fun to look back on entries from past years and remember the inside jokes, heartfelt thoughts, and snapshots of who we all were years ago.